يعرف الاستاذ الدكتور قسطنطين زريق عن نفسه، في مقدمة اعماله الكاملة، بالكلمات التالية . "أستاذا جامعيا وكاتبا وعاملا في الحقول الفكرية التي تهم المجتمع العربي في هذه الفترة الحاسمة من تاريخه..."
The exhibit "Constantine Zurayk: Knowledge at the Service of Life" was curated for the occasion of the 150th anniversary of AUB in conjunction with a seminar, entitled "Seminar in Remembrance of Constantine Zurayk", which took place at AUB on October 31st, 2016. It showcases select items from the archive of Dr. Zurayk (1909- 2000), which was generously donated to the AUB Libraries, Archives Department, by Dr. Zurayk’s family. 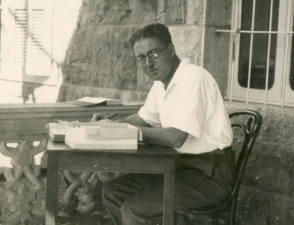 The documents, photos and letters on display here provide a glimpse onto the multi-faceted personality and rich life that Dr. Zurayk led, as well as onto some aspects of the socio-cultural and political context of a formative period in Arab modern history. For the narrative linking the various sections of the exhibit, we relied for the most part on the voice of Dr. Zurayk himself, often quoting the words he used in his autobiography, a copy of which is included in the archive. We also quoted from the introduction to his complete works, which were published in Beirut in 1994, by Markaz Dirasat al-Wihdah al-`Arabiyah, and from Dr. Aziz el Azmeh's seminal work on Zurayk, " ʻArabīyun lil-qarn al-ʻishrīn ","An Arab for the twentieth century." We hope that this exhibit, which constitutes an attempt at recounting a life that marked and inspired many in the Arab world, will serve as a testimony to the groundbreaking work of Dr. Zurayk. We also hope it will provide an incentive to do further research on a formative period of our communal Arab history, from a variety of angles,and to bring up its continuous relevance for our understanding of modern and contemporary Arab thought and societies. In particular, we hope that this introduction to the archive will encourage scholars to look more closely and in novel ways at: a) aspects of what Dr. Zurayk meant by “putting education at the service of life”, which he embodied in his various activities, responsibilities and commitments throughout his life; and b) the importance of archives in cultural understanding of the past and of one’s current place in the world. As a result, the Constantine Zuryak archive, in its richness (some 19 feet), complexity, depth, multilayered nature, and in its very construction, provenance and comprehensiveness -- Dr. Zurayk collected every scrap, document, photo and kept notes on variations in a document or address; he even preserved his birth certificate and grade school transcripts--, embodies the value of thoughtfulness, of continuous self-reflection, of self-improvement, and assessment that Dr. Zurayk upheld throughout his life in all his functions, responsibilities, actions and roles. The archive is also a testimony to a bygone era of further connectedness, and of a serious attempt to build a community of spirit through culture and education, in our Arab region. Acknowledgments: Many thanks go to Shaden Dada, Yasmine Younes, Mervat Kobeissi, Dalya Nouh and Iman Abdallah for their support in background research and content development, to Sara Jawad for her design and technical support, and most of all, to Dr. Huda Zurayk for her unwavering support and assistance.